Why do people call it the "iPhone 5"? Discussion in 'iPhone' started by Tsuchiya, May 27, 2012. My bad, I don't browse this sub-forum often at all so didn't realise. Mods, please feel free to lock this. And if it actually ends up being called the iPhone 5 - Apple is stupid too. Well, in any case, let's just hope that the iPhone 5 will be about the same size as the 4/4S, but with a 4 or so inch screen. I think the next person to start another one of these threads should be thrown into a kennel with a large pack of hungry wolves. Then when they're nearly dead, bury them alive in a coffin filled with wasps. Just re-read your post and then realise how idiotic you sound. Look at your post again. If you showed that to a bunch of 1st graders what would they answer? Boy, it's a good thing you brought this up. How is it possible that this crucial and essential issue has never been discussed before. How alert and perspicacious of you to think of this never before discussed topic. And with such clear and unassailable logic!! I know I speak for all of here on MR by saying to you...thanks so much for calling attention to this heretofore unconsidered topic! Isn't the 2012 model going to technically be number 6? Of course I've heard the rumour that what Apple had in mind for the 2011 model was a redesign, but that they decided it would be more feasible to release an updated 4, but still...officially now at least, the 4S is the 5th iPhone. I guess Apple thinks that every time they update a phone (eg. iPhone 4 to 4s) they think it is the next generation, which holds true for the most part but some people must think otherwise. It's not the 5th generation iPhone, it doesn't use 5G networks, there's no reason to call it 5. Person 1: "Just got the iPhone 5." Person 2: "Oh the 5th iPhone?" Person 1: "No the iPhone 5." They'll most likely follow what they've done with the iPad and just call it "iPhone." Logic must not be your strong point! iPhone 3gs, 4, 4S, 5 are just names. We're not keeping count or something. Only the really obsessive compulsive do. Hence their confusion. Naming has to make sense though. Google has been criticised over their versioning system for the Chrome browser. It's a much newer browser than say, Internet Explorer or Firefox, but they're already on version 22, whereas IE is on version 9! If the "iPhone 5" isn't the 5th generation iPhone then it's a stupid name. Anybody who can't comprehend that is also stupid. It does. 4/4S -> 5 and probably 5S. If we'd stick with your line of reasoning we might be calling the supposed 7S the iPhone 12. If the "iPhone 5" isn't the 5th generation iPhone then it's a stupid name. If you've got a rigid mind it is, yes. That makes more sense than calling it the 7S when it's actually the 12th iPhone! I bet it will just be called "iPhone" as I expect Apple have realised there might be confusion if they call it something stupid like iPhone 5. To people who hang around on cell phone forums too much it does. 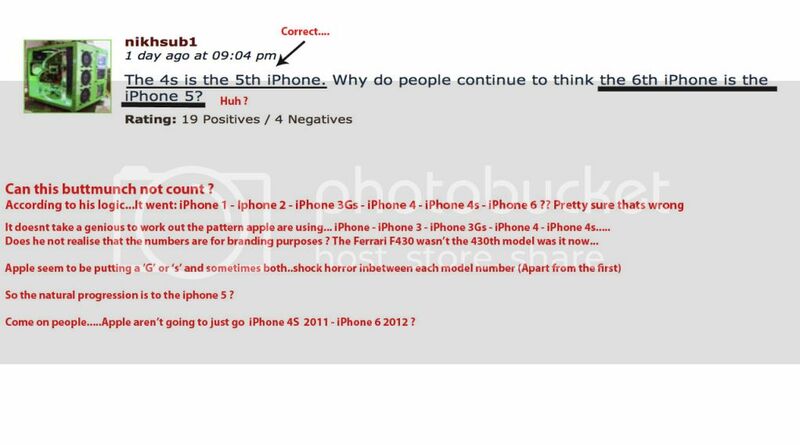 To the average person who doesn't have the slightest idea how many iPhones there were before the 4S, it doesn't. Which is why Apple will call it the 5 if they keep with the number thing. I could explain it even simpler for you, but I want you to think about it yourself. This is why people are getting pissy at you. Its not a new discussion, a simple search for iphone 6 found all these threads from the past year. Are you one of those people that go on youtube and post hate comments because you get bored ? Anyway, I agree DefBref's post does give a legitimate reason for a negative response, hence why I admitted that I was at fault for posting without browsing the forum first. Anyway, I agree DefBref's post does give a legitimate reason for a negative response, hence why I admitted that I fault for posting without browsing the forum first.